Dixie presented for Acupuncture specifically to be a part of my case study and for generalized integrative preventative care. Her owner reported that she is a great horse, but was often “saddle sour”. I provided 4 acupuncture treatments, which both aided in identifying areas of pain and treated her underlying spinal sensitivity. Her owner reports that Dixie is doing great and has been much better with saddling. Dixie is a 4 year old Quarter Horse (QH) mare. She is described as “saddle sour” by her owner, acting up and trying to avoid her saddle placement. Otherwise, her owner states she is a great, well-tempered, and reliable horse. 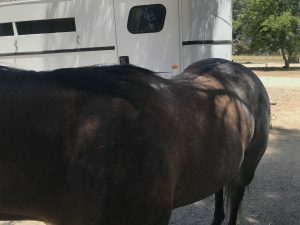 Dixie’s owner hopes to use her as a roping horse and is just starting training with her. 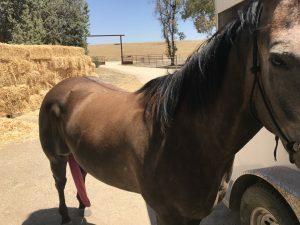 She has no current lameness, but her owner reports she has had a previous injury and effusion in her left front carpus that resolved with rest and pain medication. Dixie is not on any medications at this time. Dixie’s initial physical examination showed no lameness at a walk or trot during her gait analysis. Her vitals were normal. Her initial myofascial examination revealed sensitivity over her right caudal thoracic spine within the longissimus muscle during palpation. No significant heat was found within muscle groups. She was hesitant to drop her hips bilaterally when performing circling the hind limbs, but postural position was normal before and after active mobilization of joints in all limbs and there were no significant changes to her range of motion in her joints. Differential diagnosis for her thoracic and lumbar sensitivity include saddle fit, rider posture, vertebral disease (kissing spines, trauma, inflammatory, other), compensation from the previous left forelimb lameness, viscera-somatic response from organ dysfunction, among others. No confirmed diagnosis has been made since diagnostics were not pursued by her owner, but a presumptive diagnosis of soft tissue inflammation associated with possible saddle fit or other causes has been considered. To gauge Dixie’s response to acupuncture for the first time, I placed Seirin 0.16 x 40mm needles in Gall Bladder (GB) 21 bilaterally. She responded well. Based on Dixie’s history of resistance to her saddle and sensitivity over her thoracic spine, I performed dry needling using Seirin 0.16 x 40mm needles at Bladder (BL) 18 at both the 13th and 14th rib spaces bilaterally, BL 20 bilaterally, and BL 21 bilaterally for central and peripheral regulation. When placing BL 18 at the 14th rib space on the right side, there was a significant twitching response. This needle caused significant muscle contraction and required additional massage for removal. Baihui with a Seirin 0.16 x 40mm needle was used for central and autonomic regulation of the spine and hips. I also treated GB 29 and BL 54 bilaterally with Seirin 0.16 x 40mm needles. I advised the owner that her physical examination and needling response in the right longissimus thoracis muscle. 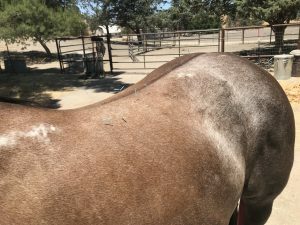 I recommended stretching exercises for these muscles and additional testing if she continues to be sensitive and reactive to saddle placement, possibly including radiographs or ultrasound. We discussed the saddle and possible need for a better fitting saddle and saddle blanket. I recommended weekly acupuncture to start. Owner reported that she had taken Dixie to her first training class last week the day after acupuncture. She did notice that she was more hesitant to perform on her right side. Her owner has been performing stretches to try to improve and loosen Dixie’s back muscles. Her examination today elicited a mild response to palpation over the thoracic spine bilaterally. I felt that she had tension and taut bands in her neck within the brachiocephalicus muscle on the right side. Dry needling with Seirin 0.20 x 40 mm needles were used at GB 21 and Tripple Heater (TH) 14 for local trigger points and peripheral regulation of neck tension. I also treated additional neck trigger points using Seirin 0.16 x 40mm needles at BL 10 and Cervical Spinal points on the right side. I continued points at BL 18 through 21, BL 54, and GB 29 bilaterally with Seirin 0.20 x 40mm needles for peripheral and central regulation. I also placed a Seirin 0.20 x 40mm needle at Baihui for autonomic response. Dixie’s owner feels that Dixie has been improving. She is continuing stretches, along with weekly training, and reports that it is going well. Her thoracic spinal sensitivity had improved and there were no notable taut bands within her neck. Her treatment was similar to the previous week. Dry needling with Seirin 0.20 x 40 mm needles were used at GB 21 and Tripple Heater (TH) 14 for peripheral regulation. Seirin 0.20 x 40mm needles were used at BL 18 through 21 bilaterally, BL 54, and GB 29 bilaterally for periperhal and central regulation, and at Baihui for central and autonomic response. Dixie’s owner requested additional acupuncture since she had been acting more sensitive along her back again. It had been 1 month since her last treatment. She has been participating in regular training sessions and her owner has been doing regular stretches with her. She has been using a slightly larger saddle and has adjusted her saddle blanket as well. Dixie showed no lameness and her vitals were normal. Her myofascial examination showed more sensitivity along her left spine, especially around the cranial lumbar region. She had some taut banding in her right brachiocephalicus muscle. We focused on doing dry needling with Seirin 0.16 x 40mm needles at GB 21 bilaterally, as well as Tripple Heater (TH) 14 and cervical spinal points on the right side for peripheral regulation and trigger point release. Seirin 0.16 x 40mm needles were used at BL 19 through 23 bilaterally for periperhal and central regulation and Baihui was used for central and autonomic response. Dixie did well with her treatments and was a great first case to help me become comfortable treating equine patients. It was interesting to see how dry needling was both diagnostic and therapeutic in identifying areas of concern along her spine. 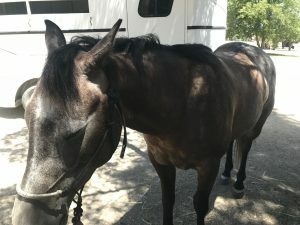 It was great to see that she is less reactive around her saddle when she participated in regular sessions and her owner truly feels that it has helped Dixie’s soreness. We plan to do regular sessions for Dixie!